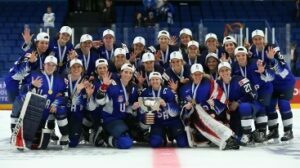 It’s a five-peat for U.S.! Annie Pankowski scored twice, including the shootout winner, as the U.S. claimed a wild 2-1 victory over Finland in the 2019 Women’s Worlds gold medal game. It’s the fifth straight American world title. The host Finns, who won their first silver medal ever, were heartbroken after they thought they’d won it all in overtime. Goalie Noora Raty put on a goaltending clinic on her hometown ice in Espoo, as the U.S. outshot Finland 52-27. “Obviously that was such an exciting game for them to take us to a shootout,” said U.S. goalie Alex Rigsby, who conceded just one goal to Minttu Tuominen on four Finnish shootout attempts. “Props to Noora. She played an unbelievable game. 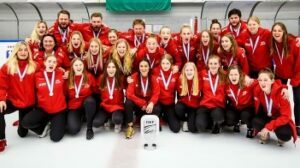 I think it’s really great for the sport as well, for us to be able to play against Finland and for them to come out and get a silver medal here in their home country. In regulation time, Susanna Tapani scored for Finland. It’s the eighth time in nine years that the Americans have prevailed, their string only broken by Canada in 2012. This is the second straight year an IIHF women’s final has been decided in a shootout. But this thriller was even more over-the-top and unimaginable than PyeongChang, where the U.S.’s Jocelyne Lamoureux-Davidson’s goal and Maddie Rooney’s final save on Canada’s Meghan Agosta were the difference. The 4-on-4 sudden-death overtime was full of wild incidents. Petra Nieminen thought she had scored the deciding goal at 11:33 of overtime. Hiirikoski made an end-to-end rush and her initial shot was stopped by Rigsby. As Rigsby slid out of the net and Hiirikoski made contact, with the U.S.’s Kacey Bellamy right on top of her, Nieminen banged the rebound into the gaping cage. A lengthy video review ensued, reminiscent of when Canada’s Anson Carter scored in overtime on Sweden’s Mikael Tellqvist in the 2003 IIHF World Championship gold medal game. When the officials waved the goal off for apparent goalie interference, the fans howled in derision. The Finns did get a power play, as Rigsby was also called for tripping on the play, but they couldn’t capitalize, and also couldn’t score when Megan Keller was called for slashing at the end of overtime. Earlier in overtime, the U.S. narrowly failed to capitalize with Finland’s Venla Hovi in the box. Finland’s first silver medal ever is an incredible achievement, especially considering that most observers figured the host nation was bound for bronze for the 13th time at this tournament. No European nation has ever played in the final before. As great as the 18 previous all-North American derbies have been, this tilt proved definitively that Finnish female players can dazzle at the highest level too. Even though the Finnish women couldn’t complete their own answer to the U.S. men’s 1980 Olympic “Miracle on Ice” victory over the Soviets in Lake Placid, what happened in Espoo over the last 11 days should retain a certain fairy-tale quality for Finnish fans. This final was always destined to hinge on Raty’s ability to deny America’s overwhelming firepower. The U.S. entered the final with 39 goals-for to Finland’s 20. The energy was through the ceiling at Espoo’s Metro Areena, starting with the pre-game introductions. The first period raced by at an extraordinary tempo, and the entire game was pure flow and thrills. While the Americans outshot Finland 17-4 in the first, Raty showed some Patrick Roy-like swagger with the way she caught and deflected pucks. The U.S finally opened the scoring at 15:46 of the second period. Pankowski got the puck from U.S. captain Kendall Coyne Schofield, crossed the blue line on the right side and used Hiirikoski as a decoy to beat Raty low to the glove side. It was her fourth goal of the tournament. With 1:31 left in the second period, the building exploded when Tapani notched the equalizer for Finland. Inside the U.S. blueline at the right point, Nieminen grabbed the puck and sent a diagonal cross-ice pass into the left faceoff circle for Tapani, who zapped it high past Rigsby on the stick side. Tapani got hot in these playoffs, notching the quarter-final winner against the Czech Republic and the semi-final winner against Canada. In 1849, the definitive version of the Kalevala, the Finnish national epic poem, was published. Now, 170 years later, the Finnish women’s national hockey team has begun to forge its own legend — even if it is written in silver letters rather than gold. In 18 previous Women’s Worlds meetings, Finland had just one win (1-0 in overtime in 2008) and one tie (1-1 in 1997) versus the Americans. The Finns have lost eight straight Olympic games to the U.S. Earlier, the Canadians settled for bronze after beating Russia 7-0. Canada holds the record for the most consecutive Women’s Worlds golds with eight straight between 1990 and 2004, and 10 in total. This was the ninth American gold. In 2020, will the Americans make it six in a row? Can Canada return to the top of the podium? Or will the Finns go all the way? Join us again next year at the IIHF Ice Hockey Women’s World Championship in Halifax and Truro, Nova Scotia, Canada. It might be the consolation prize, but it’s still a prize. 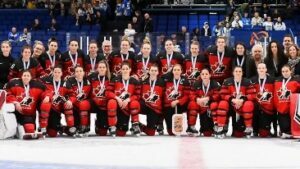 Canada earned its first IIHF Ice Hockey Women’s World Championship bronze medal ever with a 7-0 win over Russia in Espoo on Sunday. The Canadians will need time to fully assess what went wrong for them at this tournament. They played solid hockey and came second in Group A, but then suffered a dramatic 4-2 semi-final loss to the fired-up host Finns on Saturday. Never before has a Women’s Worlds concluded without a Canada-U.S. showdown for gold. Instead, it’s the U.S. versus Finland in the final. Canada hasn’t won the Women’s Worlds since now-assistant coach Caroline Ouellette scored the 5-4 overtime winner against the U.S. in the 2012 gold medal game. That’s a long drought for the country that invented hockey. Only seven players from 2012 returned with this year’s team. In IIHF history, the Canadian women own four Olympic gold medals, plus 10 Women’s Worlds gold medals and eight silver medals. On the bright side, Canada’s medal streak extends to 19 straight Women’s Worlds. Against the Russians, first-year phenom Loren Gabel scored twice for Canada. Natalie Spooner, Rebecca Johnston, Jamie Lee Rattray, and Erin Ambrose tallied a goal and an assist apiece for Canada. Bourbonnais got her first career Women’s Worlds goal. Sarah Nurse and Renata Fast added two assists apiece. The outmatched Russians failed in their bid to capture their fourth Women’s Worlds medal. The previous three medals were all bronze (2001, 2013, 2016). An inability to clamp down defensively like the Finns – historically their main competition for bronze – or even the Japanese – who limited the powerful Americans to a 4-0 quarter-final win – stung coach Alexei Chistyakov’s skillful players. An old Canadian adage came to mind in regard to Russia’s performance: “You miss 100 percent of the shots you don’t take” (Wayne Gretzky). The Russians were outshot 41-6 at Metro Areena. The single-game tournament record for the fewest shots on goal by a team in one game is 2, shared by Kazakhstan (in a 13-0 loss to Canada on 3 April, 2005) and Switzerland (in a 7-1 loss to the U.S. on 6 April, 2008). Both Russia and Canada started the same netminders as in Canada’s 5-1 round-robin win: Genevieve Lacasse and Nadezhda Morozova. It was just Lacasse’s second start here, and she got her first career Women’s Worlds shutout. The 29-year-old Montreal native, who first played for Canada at the 2015 tournament in Sweden, backstopped Canada to a 2-1 group stage win over the U.S. at last year’s Olympics. Spooner, who became the first player to win both an Olympic gold medal and a CWHL Clarkson Cup with the Toronto Furies in the same year (2014), also converted two wraparounds on Morozova in the round-robin game. Bourbonnais made it 2-0 at 15:31 with a nice, rising slapshot from just outside the right faceoff circle. Top Canadian blueliner Laura Fortino saw time at forward in the absence of Blayre Turnbull, who was injured in the loss to Finland. At the intermission, Turnbull, scratched top goalie Shannon Szabados, and injured captain Marie-Philip Poulin were all seen walking down from the stands to support their teammates in the Canadian dressing room. In the second period, the Canadian target practice continued. At 9:38, Johnston caught Morozova flat-footed with her quick five-hole shot from the left faceoff circle to put Canada up 3-0. The game then witnessed a litany of sloppy penalties, mostly to Russia. However, Canada neglected to extend its lead with the power play in the second period. At 3:09 of the third, Gabel capitalized on a giveaway by the Russia netminder to make it 4-0. The 21-year-old has been a bright spot for Team Canada in Finland. “We now have what I would call a legitimate natural goalscorer,” said Pearn. Rattray got Canada’s first power play goal of the evening at 8:13 on a video-reviewed deflection. Fortino, unfortunately, hobbled off after getting tangled up in a collision with an opponent, and stayed off. At least her teammates had the game well in hand. Ambrose swooped in from the point to collect a loose puck and roof it home for another power play marker and a 6-0 edge at 14:21. And Gabel scored again on a breakaway less than a minute later, tying her with Spooner for the team lead in goals (six). Russia yanked Morozova in favor of Anna Prugova to close out the game. Overall, there are some positive indications for the Russians. While they clearly have a long way to go before they can compete effectively with the North Americans, their program has not regressed. Russia has now come fifth or better at eight of the last nine Women’s Worlds. More investment, ice time, coaching, and general prioritization of women’s hockey could spur improved results in the future for a country that produces some of the world’s most talented male players. We’ll wait and see what happens when Russia comes to Canada for the 2020 IIHF Ice Hockey Women’s World Championship in Halifax and Truro, Nova Scotia. 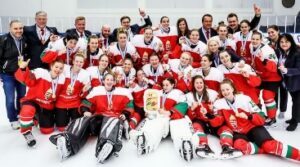 Host Hungary won the gold medals at the 2019 IIHF Ice Hockey Women’s World Championship Division I Group A in Budapest by only having one blemish on its record which was a shootout lose to Slovakia. They will be promoted together with second-ranked Denmark. “This is a sweet taste since there was tremendous pressure on the team. We played against some hard opponents as we battled for promotion, this is a great feeling right now. We needed to play as a team and not rely on two or three key players,” said Hungary’s head coach Pat Cortina after the last game, a win against neighbour Austria. Heading into the tournament there were no clear-cut favourites to win the group but it did make things easier that the top-two teams in the group were to move up to the top division with the new format and ten teams. Hungary and Denmark will replace Sweden and France for the 2020 IIHF Ice Hockey Women’s World Championship in Halifax, Canada. Everyone knew that a loss would not eliminate the chances of promotion but make things harder. When asked just about what their expectation were for the tournament, almost every head coach said the same. That they will be taking the tournament one game at a time but they feel that they have a team that can earn promotion to play in Halifax next year. Back to Budapest, the 2019 IIHF Ice Hockey Women’s World Championship Division I Group A started off with Denmark getting past Slovakia by the score of 3-1 thanks to a brace by Josephine Jakobsen. In the second game of the opening day Hungary just got past Norway 2-1 as Averi Nooren scored a goal and helped set up one as well. The opening day closed out with Austria cruising past Italy 4-1, Theresa Schafzahl closed out the match with two goals. All six teams were back on the ice the following day, Denmark got past Italy 6-1 as all six goals were scored by someone different. Hungary hit a road bump as they lost to Slovakia 2-1 in sudden death shootout. Norway squeaked out a one goal win in a game that produced nine goals in total. After the second day the two Scandinavian countries were sitting at the top of the standings.